« GO! Smell the moles in the garden! In the past week, my oldest son just took a job as a manager at a restaurant, opting out of University for another six months. He says he’ll start back next semester. We’ll see. My youngest is in her final year of high school and every day is a dilemma. Drama, dramah — DRAMAH! I have two adult children, and one who thinks she’s an adult. Honestly? It was easier when they were in diapers. It was easier when they were scrambling to poke things into electrical outlets, shoving foreign items into their mouths and climbing the bookcases. It was easier to keep the eyes “on the back of my head” open, and I could distinguish between the squeals of laughter and the screams of frustration coming from the back yard. Now days, I can’t quite tell who is screaming for joy or anger. It’s all becoming a blur. My response to their anxieties, mishaps and adventures hasn’t matured either. I’m still a blithering mess when their hearts get broken. Only now I cannot “fix” a dead roly-poly bug by sneaking out and quickly getting another from under a flower pot from the back porch — their broken hearts are infinitely deeper and much more complicated. When my soon to be ex-husband told the world on his blog that I had “too much baggage” he was referring to my children. He’d been “dating” me for two years — had been as much a part of their lives as any other adult in our immediate family — and it was shocking to hear him explain his motives for our separation. He had commented frequently on my daughters “bad wiring” as he put it — and essentially insulted my children as often as he could. This should have been a red flag for me; I ignored the signs posted and even how he referred to his own progeny. All of this is merely academic now, what remains is that I am single parenting adult and nearly adult children. It was easier years ago when they didn’t need adult answers — or gas money. Some of us are parents, on the way to becoming parents (Congrats Mighty Morgan!) and some of us have decided that children aren’t a part of the mix. If I have learned anything in the last twenty years of being “Mom” — I’ve learned that you can never be smart enough, rich enough or present enough. There is no single one good formula for raising a child. However, I do believe that if a child knows that they are loved, it creates the best foundation for all situations. What wisdom have you learned from your parents or guardians that remains with you today? What do you wish they had told/shown you, and what do you wish they had done differently? *BTW -- that pic up there? 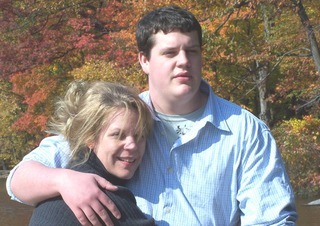 That's yours truly and the middle child when he had his sr. photo's done. the best one I learnt off my dad is that if you are having an arguement violence should be the first solution not the last course of action. Wow. And here I believed we had cornered the market on putting the “fun” in dysfunctional. Thanks for all the positive feedback dude. Blue Collar Goddesss last blog post..Go …t four minutes? I hope your ex husband gets knocked over by a bus. that then reverses back over him. you see I am just trying to help the world! Lets hope this is a place for inspiration, one day. Thanks for sharing this Blue Collar! BCG I am only having a laugh!! Apologies if it comes off wrong no offence is intended its just my slightly dark sense of humour. Once again no offence intended at all. Also having seen the size of your son I’ll defer to whatever you say!! My Dad always told me to always turn up early for work, polish my shoes before an job interview and open doors for ladies. If you must fall out with your partner, always try to make up before you go to bed. Its not ground breaking stuff but he is/was always there and even now, with two children of my own and 3 step daughters, both he and my mum always love us to visit and then proceed to spoil us all rotten the whole time we’re there. I may not live with my children any more (they live with their mum) but I phone them every 2 days and the ‘every-other’ weekends i get them i always try to do something, even if its a walk to a park etc. We have a great time and lots of hugs. Congratulations BCG!!! One good sign is that you know what concerns your children…gas money. I’m kidding because you do seem to be in touch with them. I didn’t get my driver’s license until I was a freshman in college, but I had very good friends who drove. Anyway, unfortunately my husband and I have decided not to have children…too old. Trying to retire and put kids through college at the same time…not going to work. There obviously are other things. AMEN to a sense of humor! And to a foundation of love. I think the “trust” issue is also important — but it’s a street that must run both ways. I honor people such as yourself who have devoted their lives to assisting others in times of need. You may not have any children of your own, but it does take a “village” — thank you for being a part of your village. Thank you for the compliment. I agree with the trust issue that it is a two way street, but children learn about trusting from their parents to a point. And, the rebellion in at around two and teen years are the same developmental issues. At two, they act it out, but as teens they can verbalize it…and act it out. However, boundaries, expections and rules are necessary no matter how much trouble it may cause. It teaches them about the real world. Also, it teaches them about trust. Teens, although most won’t admit it, developmentally require boundaries from their parents. It makes them feel safer because deep down they know that they are scared and really don’t know everything. In order for them to trust you, you need to form a bond, earn their trust…it isn’t always automatic. One of the biggest mistakes a parent can make is not being able to take responsibility when they are wrong and tell their child, “I am sorry. I was wrong. I let my emotions get in the way where I wasn’t thinking about you. Let’s discuss it.” Respect earns trust. Sorry, when I get passionate…I just keep going. As a young adult, I find that having a parent – especially mother around so that I can consult whatever that I have in my mind is most comforting but unfortunately there is no one around for me..
Sarahs last blog post..Independence Day – How Independent Are We? Wow, loads of advice from my dear ma ma. And from my dad? Just do your best. I’ve been lucky to have the least judgemental and most supportive parents and I don’t think I would have wanted them to bring me up in any other way. Apart from a bit more pocket money here and there. Tightwads. Lib, that is absolutely wonderful what you wrote. Very heart-warming!! You are lucky to have such parents..
Let others get their food first and politely follow on after others – thry had to rein the 3 of us in. II don’t think there is one particular formula or recipe for raising children…I write this not through my own experience as a parent , but more through my own observations of the dynamics of my own family. My eldest sister is a lawyer, the next one is a speech pathologist and my youngest brother is a doctor. Now we all had the same parents…yet I grew up to be a junkie. They loved me and supported me as much as they did my other brother and sisters…but yet I still got lost and had to find my way back. I think we all have our paths in life…good, loving parents can help us in our journey…but in the end it’s all on us. Ah, but you may have the same parents; however, each one experiences the same events from their own perspective taking into account personality, temperment, etc. Some siblings may need more of something in one area that the others do not. Also, birth order definitely makes a difference. And, even the best parents as much as they want to treat each one differently and definitely have different types of attachments. Much also really depends on the child’s unique qualities and needs and the parents ability to tune into those differences and the child’s ability to cope with disappointment and pain. anyways I have learnt the following..
its not the noise you need to be worried about .. its the silence..
there is no such thing as the terrible twos… it is the terrible teens..
if they get the first year of High School with out hassles then life will be bliss.. if not prepare yourself for a very bumpy ride..
they get harder has they get older and you will long for the good old days of tantrums..
they chould always now they are loved and have a place to go..
they now every thing when the reach 16 and forget it all when they move out…. love them, hugs them and most of all talk to them…. about EVERYTHING…..
Great stuff AC!! Be very afraid of the silence!!! Regarding the terrible twos, that is a developmental must do as is the tulmultuous teens. If the twos are mild, the teens years will be tougher…guaranteed!! I’ve learned that tantrums become more sophisticated as we all age. Keep the communication going and yes, NEVER lie!!! You sound like a great parent…your children have taught you well!!! totally agree about the terrible twos…. There HAS to be a book in there AC!? a book from the library or from me…???? ?